As I enter the office, I notice a faint smell of exhaust and a fresh motorcycle tire skid mark on the red epoxy floor. Bernard Khoury greets me with a warm — if overwhelmed — smile. He has just flown in from an architects’ conference in Sri Lanka and coincidentally, so have the boxes from SKIRA, his publisher in Italy. He reaches for one of the stacks of freshly bound books piled around him and hands me my copy of ‘Local Heroes.’ Small, but 400 pages thick, it fits snugly into the crook of my hand. Having contributed some text and photographs to the book, I’m more than familiar with it, but its long anticipated arrival is thrilling regardless. ‘Local Heroes’ is not a monograph, nor a manifesto, nor an architectural catalogue. 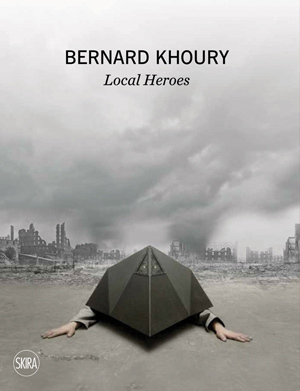 Instead, the first comprehensive account of Khoury’s work reads like a pictographic novella. Sandwiched between two photo albums, the text unfolds as a sequence of anecdotes interspersed with architectural renderings, drawings and photographs. In fact, the book’s structure and content never ceases to shift right until the end. 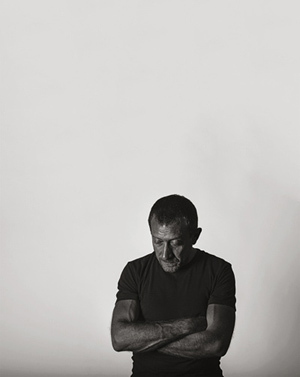 Khoury explains that the book was an important exercise at a point in his career where there was a need to make sense of different projects, to see his body of work clearly formulated, on paper. The stories recounted are at times dark and cynical, or humorous, absurd even, told in Khoury’s sarcastic voice and representative of the various characters the architect has encountered since his return to Beirut and the start of his career, after receiving a Masters in Architectural Studies from Harvard University back in 1993. These characters — The Landowner, The Corporate Mogul, The Man Overseas — make appearances throughout the book, and it’s through them that readers are introduced to the architect’s work. In person, Khoury is a fantastic raconteur, one who paints a colorful picture in a low voice, whether he is talking about the conception of BO18 or his visits to Germany, the Gulf and Nagorno-Karabakh. Along with the different dynamics involved in working with the real estate industry came other and tougher battles. “The private sector has been blindly applying the same residential building typology for over 40 years, one that leads to deep slabs and corridors (read dark spaces), blind cores (read dark staircases) and glazed balconies (read increased isolation from the public realm). The political resistance takes place at this front.” In conjunction with a departure from the aforementioned typology and an application of materials that deviates from the construction industry’s standards, his buildings stand out from the surroundings they are anchored in, often appearing raw and industrial, and possessing a more sophisticated relationship to their territory. One of his latest ‘combatants’ has risen on the edge of agricultural land in Furn el Chebbak, expected to be completed by the end of 2015. Plot #1282|3853, also known as Factory Lofts, is an aggressive looking edifice whose north and south ends taper into triangular blades. “Only 1.5 percent of the plot’s periphery borders a municipal plot, which means that years down the line, the building could end up surrounded by blind party walls on 98.5 percent of its boundary! Since our project is one of the first in an area that will eventually fall prey to the city’s swift urbanization, we decided to implement an all-round setback, thus creating a building that never turns its back on its neighbor. 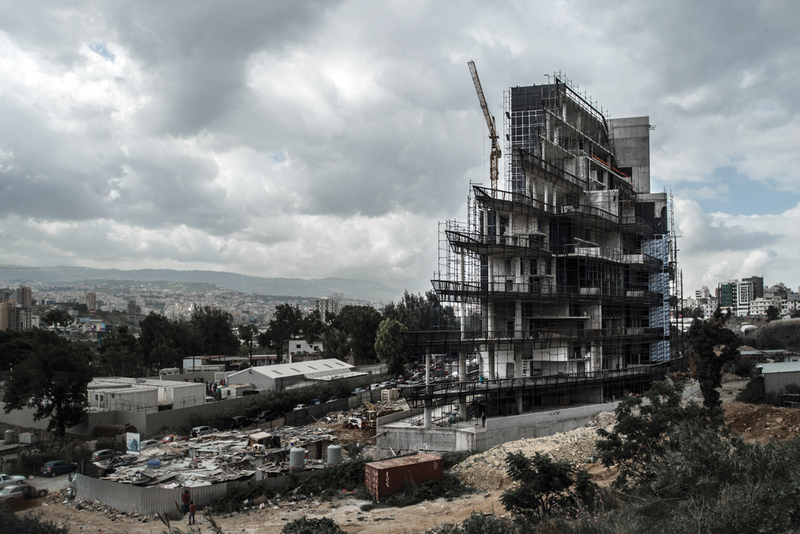 In contrast to its appearance, which is a result of a direct translation of the building code, it is the most well intentioned gesture we could possibly create.” Khoury is hopeful that potential neighbors will take note and refrain from building on the setback, which would require the erection of 50 meter tall blind walls. Plot #1282|3853, along with many others, has been photographed and placed in the book in a 100 page series. Entitled ‘Drive-by Shooting’, this album comprises extracts from ongoing surveys of Khoury’s work whether they’re old, just completed or still under construction. Such exercises set him apart from the architectural practices that do not venture out beyond the design-and-build aspect of architecture. Khoury stays busy on the artistic front as well. Following 2014’s ‘Fundamentalists and Other Arab Modernisms’ installation — a large circular table, library and fresco that traced 100 years of modern architecture in the Arab World— made in collaboration with the Arab Center for Architecture that showed at the Bahrain Pavilion at the Venice Biennale 14th Architectural Exhibition, Khoury exhibited two different pieces in April at Milan, an installation using marble, a material he hasn’t previously worked with, and a lighting design for Viabizzuno. I look at the sheet of paper he has been drawing on: an elderly man and a woman looking in opposite directions, their elongated bodies emaciated by old age. “Can I keep it?” I ask. “Sure” and we exchange a freshly snapped Polaroid for his drawing. Editor’s note: Although the author was initially paid for her contribution to Khoury’s book, she receives no royalties or other payments from further sales.